Mushrooms cooked on the grill – still not quite familiar to the Russians dish. But every year, this situation is gradually changing, as fans of the barbecue you start to appreciate this kind of recipe, especially since the mushrooms on the grill are cooked quite quickly, simply, very tasty and tender. 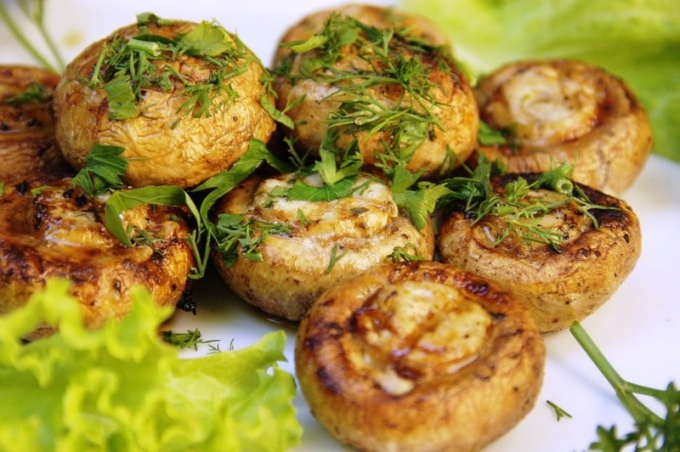 For future cooking mushrooms on the grill required the actual mushrooms themselves (for companies from 5-6 people will need 1-1,5 kg of product), two large lemon, half spoon of sea salt, 50-60 ml of vegetable oil (sunflower and olive) and spices to taste. If you want the dish turned out beautiful, and the mushrooms did not collapse during the cooking process, you need to acquire fresh mushrooms, which have a stem which is firmly connected with a hat. So, the first stage of preparation involves thorough washing of mushrooms. Then the mushrooms should be placed in a deep bowl, sprinkle them with lemon juice (make sure that along with him came the seeds, which are strongly bitter taste), sprinkled with salt, herbs and spices. Before marinating the mushrooms, you need to carefully mix to the marinade worked on all parts of the mushrooms. Optimal for marinating mushrooms time is about 5-6 hours in a pot with a very tight fitting lid. Open fire roasting mushrooms on the skewers will not work, need to wait for formation of large and hot coals (the best fit birch wood). Then you need to thread the mushrooms, and very tightly, so that the mushrooms are not dry, they do not burn and retained its juiciness. Flip the skewers need quite often, and cook mushrooms on hot coals about 15-20 minutes, of Course, mushrooms are a product which can be used even in fresh form in salads or other dishes, but still is good to fry them until education appetizing Golden brown. By lapse of time the mushrooms should be gently and very carefully remove from the skewers and put into a large, deep dish. For decoration perfect finely chopped fresh herbs (still dill, parsley, chives or Basil), and a small amount of lemon juice, which you just need to sprinkle the cooked mushrooms. You can also do the other way is to put it on a plate leaves of green salad, which has already put the fried mushrooms. For decoration of the dish is perfect and the garnish of fresh summer vegetables – cucumbers, sweet pepper, radish or other. This dish, for all its lightness it is quite hearty, so if you also want to treat themselves to skewers of meat or chicken, it is better not to overeat in pre-mushroom.